With 1.1 million people deciding to switch to another bank in the past year, competition for your current account is stronger than ever. Add to the mix a number of new challenger banks, which are preparing to launch over the next year, and the battle for your current account looks set to further intensify. We have combined data showing the net gain (or loss) of customers by brand with the Smart Money People overall rating for current accounts. 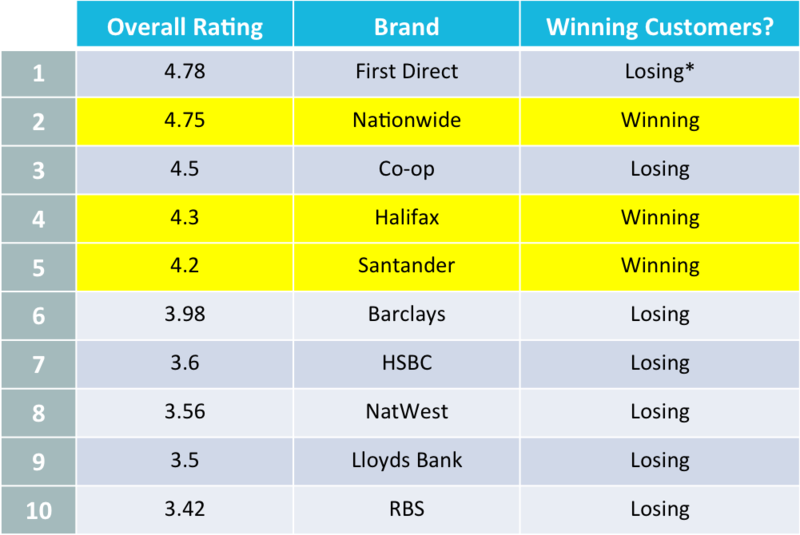 This shows correlation between the three banking brands which gained customers and those which have the highest rating on Smart Money People (see table below). Why do Halifax and Santander win? Halifax has long offered an attractive monetary incentive to encourage switchers. With a £125 switching offer and a £5 a month reward, customers have clearly been attracted by the potential to earn up to £185 in their first year. Despite being part of Lloyds Banking Group, the Halifax brand has also benefited by being seen as a challenger brand, devoid of the negative sentiment surrounding big banks like Lloyds, RBS, HSBC. In fact, a number of consumers still believe that the Halifax is a building society. Hot on the heels of Halifax are the Clydesdale and Yorkshire banks, who now offer an industry leading £150 benefit for current account customers switching to them. 93% of switchers to Santander chose the 123 account which provides a 3pc interest on balances between £3,000 and £20,000, as well as up to 3pc cash back on household bills, for a monthly fee of £2. The 123 account remains one of the most innovative around and shows how customers can easily comprehend what is a fairly complex product. The 123 account is also widely believed to have helped Santander increase its cross-sell of other banking products, for example, mortgages and ISAs. Is digital innovation the next frontier? It’s not clear that customers are making banking provider decisions based on the digital capability of each brand. While some banks have a digital head start, for example Barclays, a clear differentiator has yet to be established. Exciting customers looks set to be key, and there are some increasingly pioneering plans being developed, making digital innovation an important new frontier.